NEF Armenia Country Director Arpine Baghdoyan address a crowd of partners for an upcoming project to address survivors of Gender-Based Violence in Armenia. 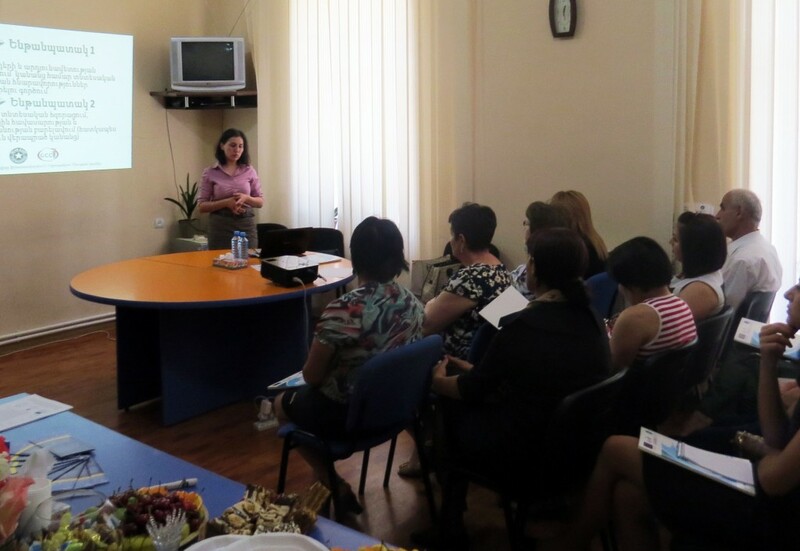 YEREVAN, Armenia – This past June, organizers met to discuss a project to deliver economic development programs to support gender equality and protect women against gender-based violence being launched by the European Union (EU), our own Near East Foundation UK (NEF-UK), and the Gegharkunik Chamber of Commerce and Industry (GCCI). The project, 95 percent funded by the EU under the European Instrument for Democracy and Human Rights (EIDHR) will be implemented in Yerevan, Syunik Province, and the Lori Province to improve protection, gender equality, agency, and economic independence for women survivors of gender-based violence. Over a two-year period, the project will help 200 gender-based violence survivors gain increased employability, small business skills, and safe access to economic opportunities. Sixty women will be offered tailored vocational training with accredited certificates, 120 will receive targeted business and financial support to start their own micro-businesses, and 80 will be offered tailored employment development support. The project aims to increase confidence and self-reliance amongst survivors, so that women can make choices and shape the choices that affect their lives. The project works with four civil society organisations to engage the public, support groups, employers, and other civil society and market actors across many sectors in joint actions, dialogue, and training around norms, safe workspaces, and protection strategies linked to economic opportunities. The project will build commitment to preventing gender-based violence and promoting gender equality among community leaders and employers. GCCI—a Gavar-based chamber of commerce that aims to promote sustainable local economic development through market assessment, business development, and micro-credit – and NEF UK started the project on 21 January 2015. The project is due to be completed by 20 January 2017.